Download "GLOBAL FINANCIAL PRIVATE CAPITAL Job Description. JOB TITLE: Client Relationship Manager"
1 GLOBAL FINANCIAL PRIVATE CAPITAL Job Description JOB TITLE: Client Relationship Manager Reports To: Financial Advisor Exempt Prepared by: ADP Resource June 10, 2014 SUMMARY This position is primarily responsible for managing customer expectations and maintaining a high degree of customer satisfaction. This position is also responsible for acting as a resource for the customer and identifying solution selling opportunities by performing the following duties ESSENTIAL DUTIES AND RESPONSIBILITIES: Core duties and responsibilities include the following. Other duties may be assigned. Serves as Office manager, account processing including account opening/closing, account transferring, mutual fund and securities processing, insurance paperwork processing, retirement account maintenance. Serves a client service and relationship manager for a client book of Possesses experience in troubleshooting and quickly resolving financial matters without involving the advisor. Promotes, develops, coordinates campaigns such as die communication to clients on a weekly basis, quarterly updates such as newsletters and lunch and learns. 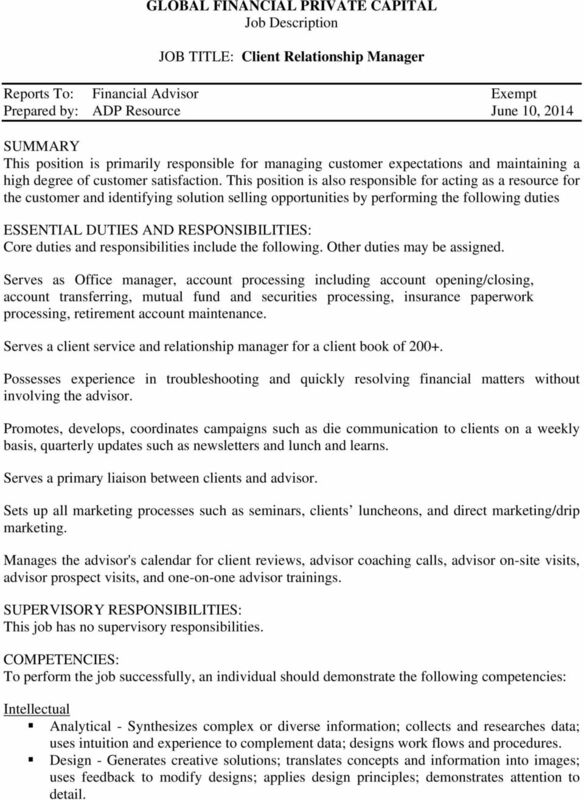 Serves a primary liaison between clients and advisor. Sets up all marketing processes such as seminars, clients luncheons, and direct marketing/drip marketing. Manages the advisor's calendar for client reviews, advisor coaching calls, advisor on-site visits, advisor prospect visits, and one-on-one advisor trainings. SUPERVISORY RESPONSIBILITIES: This job has no supervisory responsibilities. COMPETENCIES: To perform the job successfully, an individual should demonstrate the following competencies: Intellectual Analytical - Synthesizes complex or diverse information; collects and researches data; uses intuition and experience to complement data; designs work flows and procedures. Design - Generates creative solutions; translates concepts and information into images; uses feedback to modify designs; applies design principles; demonstrates attention to detail. 2 Problem Solving - Identifies and resolves problems in a timely manner; gathers and analyzes information skillfully; develops alternative solutions; works well in group problem solving situations; uses reason even when dealing with emotional topics. Project Management - Develops project plans; coordinates projects; communicates changes and progress; completes projects on time and budget; manages project team activities. Technical Skills - Assesses own strengths and weaknesses; pursues training and development opportunities; strives to continuously build knowledge and skills; shares expertise with others. Interpersonal Customer Service - Manages difficult or emotional customer situations; responds promptly to customer needs; solicits customer feedback to improve service; responds to requests for service and assistance; meets commitments. Interpersonal Skills - Focuses on solving conflict, not blaming; maintains confidentiality; listens to others without interrupting; keeps emotions under control; remains open to others' ideas and tries new things. Oral Communication - Speaks clearly and persuasively in positive or negative situations; listens and gets clarification; responds well to questions; demonstrates group presentation skills; participates in meetings. Written Communication - Writes clearly and informatively; edits work for spelling and grammar; varies writing style to meet needs; presents numerical data effectively; able to read and interpret written information. Teamwork - Balances team and individual responsibilities; exhibits objectivity and openness to others' views; gives and welcomes feedback; contributes to building a positive team spirit; puts success of team above own interests; able to build morale and group commitments to goals and objectives; supports everyone's efforts to succeed. Leadership Visionary Leadership - Displays passion and optimism; inspires respect and trust; mobilizes others to fulfill the vision; provides vision and inspiration to peers and subordinates. Change Management - Develops workable implementation plans; communicates changes effectively; builds commitment and overcomes resistance; prepares and supports those affected by change; monitors transition and evaluates results. Delegation - Delegates work assignments; matches the responsibility to the person; gives authority to work independently; sets expectations and monitors delegated activities; provides recognition for results. Leadership - Exhibits confidence in self and others; inspires and motivates others to perform well; effectively influences actions and opinions of others; accepts feedback from others; gives appropriate recognition to others. Managing People - Includes staff in planning, decision-making, facilitating and process improvement; takes responsibility for subordinates' activities; makes self available to staff; provides regular performance feedback; develops subordinates' skills and encourages growth; solicits and applies customer feedback (internal and external); fosters quality focus in others; improves processes, products and services. ; continually works to improve supervisory skills. 3 Quality Management - Looks for ways to improve and promote quality; demonstrates accuracy and thoroughness. Organization Business Acumen - Understands business implications of decisions; displays orientation to profitability; demonstrates knowledge of market and competition; aligns work with strategic goals. Cost Consciousness - Works within approved budget; develops and implements cost saving measures; contributes to profits and revenue; conserves organizational resources. Diversity - Demonstrates knowledge of EEO policy; shows respect and sensitivity for cultural differences; educates others on the value of diversity; promotes a harassmentfree environment; builds a diverse workforce. Ethics - Treats people with respect; keeps commitments; inspires the trust of others; works with integrity and ethically; upholds organizational values. Organizational support - Follows policies and procedures; completes administrative tasks correctly and on time; supports organization's goals and values; benefits organization through outside activities; supports affirmative action and respects diversity. Strategic Thinking - Develops strategies to achieve organizational goals; understands organization's strengths & weaknesses; analyzes market and competition; identifies external threats and opportunities; adapts strategy to changing conditions. Self-management Judgment - Displays willingness to make decisions; exhibits sound and accurate judgment; supports and explains reasoning for decisions; includes appropriate people in decision-making process; makes timely decisions. Motivation - Sets and achieves challenging goals; demonstrates persistence and overcomes obstacles; measures self against standard of excellence; takes calculated risks to accomplish goals. Planning/Organizing - Prioritizes and plans work activities; uses time efficiently; plans for additional resources; sets goals and objectives; organizes or schedules other people and their tasks; develops realistic action plans. Professionalism - Approaches others in a tactful manner; reacts well under pressure; treats others with respect and consideration regardless of their status or position; accepts responsibility for own actions; follows through on commitments. Quality - Demonstrates accuracy and thoroughness; looks for ways to improve and promote quality; applies feedback to improve performance; monitors own work to ensure quality. Quantity - Meets productivity standards; completes work in timely manner; strives to increase productivity; works quickly. Safety and Security - Observes safety and security procedures; determines appropriate action beyond guidelines; reports potentially unsafe conditions; uses equipment and materials properly. Adaptability - Adapts to changes in the work environment; manages competing demands; changes approach or method to best fit the situation; able to deal with frequent change, delays, or unexpected events. Attendance/Punctuality - Consistently at work and on time; ensures work responsibilities are covered when absent; arrives at meetings and appointments on time. 4 Dependability - Follows instructions, responds to management direction; takes responsibility for own actions; keeps commitments; commits to long hours of work when necessary to reach goals; completes tasks on time or notifies appropriate person with an alternate plan. Initiative - Volunteers readily; undertakes self-development activities; seeks increased responsibilities; takes independent actions and calculated risks; looks for and takes advantage of opportunities; asks for and offers help when needed. Innovation - Displays original thinking and creativity; meets challenges with resourcefulness; generates suggestions for improving work; develops innovative approaches and ideas; presents ideas and information in a manner that gets others' attention. QUALIFICATIONS: To perform this job successfully, an individual must be able to perform each essential duty satisfactorily. 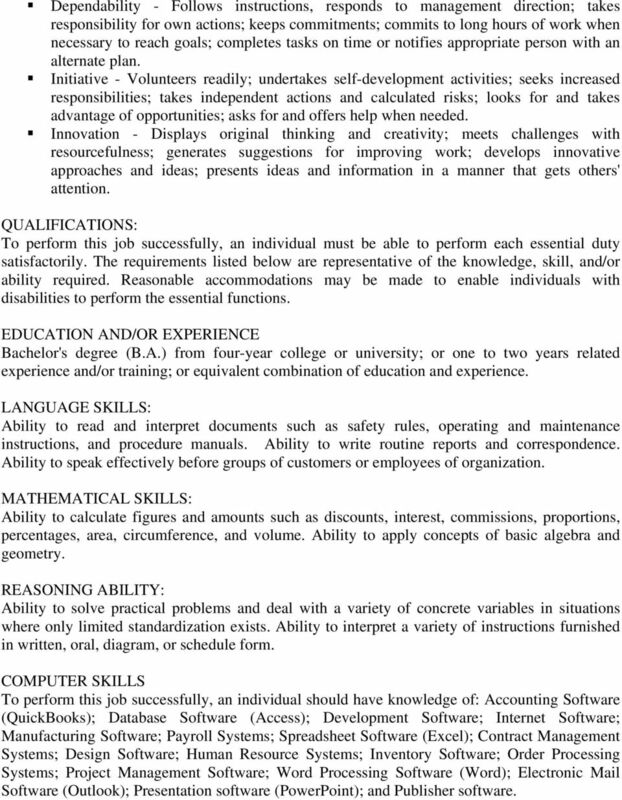 The requirements listed below are representative of the knowledge, skill, and/or ability required. Reasonable accommodations may be made to enable individuals with disabilities to perform the essential functions. EDUCATION AND/OR EXPERIENCE Bachelor's degree (B.A.) from four-year college or university; or one to two years related experience and/or training; or equivalent combination of education and experience. LANGUAGE SKILLS: Ability to read and interpret documents such as safety rules, operating and maintenance instructions, and procedure manuals. 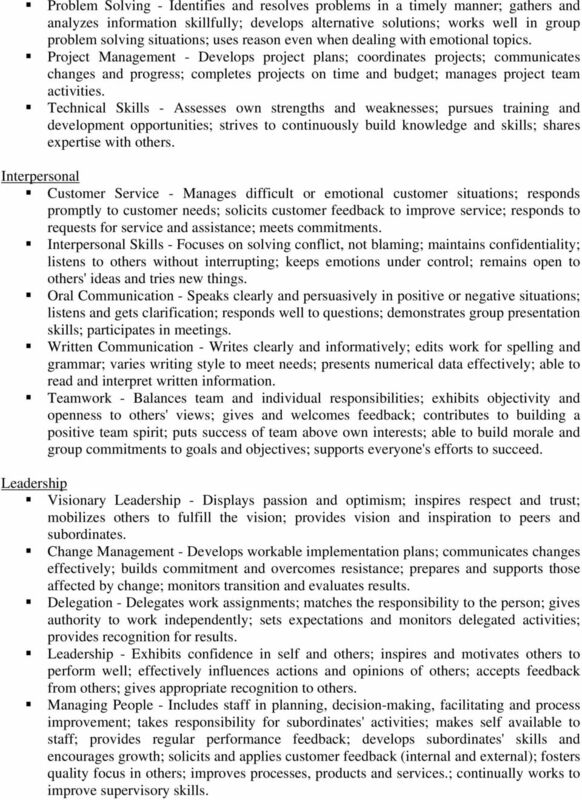 Ability to write routine reports and correspondence. Ability to speak effectively before groups of customers or employees of organization. MATHEMATICAL SKILLS: Ability to calculate figures and amounts such as discounts, interest, commissions, proportions, percentages, area, circumference, and volume. Ability to apply concepts of basic algebra and geometry. REASONING ABILITY: Ability to solve practical problems and deal with a variety of concrete variables in situations where only limited standardization exists. Ability to interpret a variety of instructions furnished in written, oral, diagram, or schedule form. COMPUTER SKILLS To perform this job successfully, an individual should have knowledge of: Accounting Software (QuickBooks); Database Software (Access); Development Software; Internet Software; Manufacturing Software; Payroll Systems; Spreadsheet Software (Excel); Contract Management Systems; Design Software; Human Resource Systems; Inventory Software; Order Processing Systems; Project Management Software; Word Processing Software (Word); Electronic Mail Software (Outlook); Presentation software (PowerPoint); and Publisher software. 5 OTHER SKILLS AND ABILITIES: Ability to build solid, effective working relationships with others Ability to execute instructions and request clarification when necessary Ability to maintain flexible work hours as overtime may be necessary OTHER QUALIFICATIONS: Minimum 1 year experience with broker/dealer and/or RIA related paperwork Minimum 1 year experience as an advisor's assistant Working knowledge of NFS and Fidelity paperwork requirements, systems and processes Organizational and time management skills sufficient to prioritize workload, handle multiple tasks and meet deadlines Excellent attention to detail and follow-up Advanced problem solving skills to effectively analyze, research and resolve inquiries in a timely manner Excellent interpersonal skills to work effectively with staff of all levels Constant self-development by keeping up to date on system enhancements, online training, and implementing new systems to make the practice run smoother. PHYSICAL DEMANDS: The physical demands described here are representative of those that must be met by an employee to successfully perform the essential functions of this job. Reasonable accommodations may be made to enable individuals with disabilities to perform the essential functions. While performing the duties of this job, the employee is regularly required to sit; use hands to finger, handle, or feel; reach with hands and arms and talk or hear. The employee is occasionally required to stand and walk. The employee must occasionally lift and/or move up to 10 pounds. 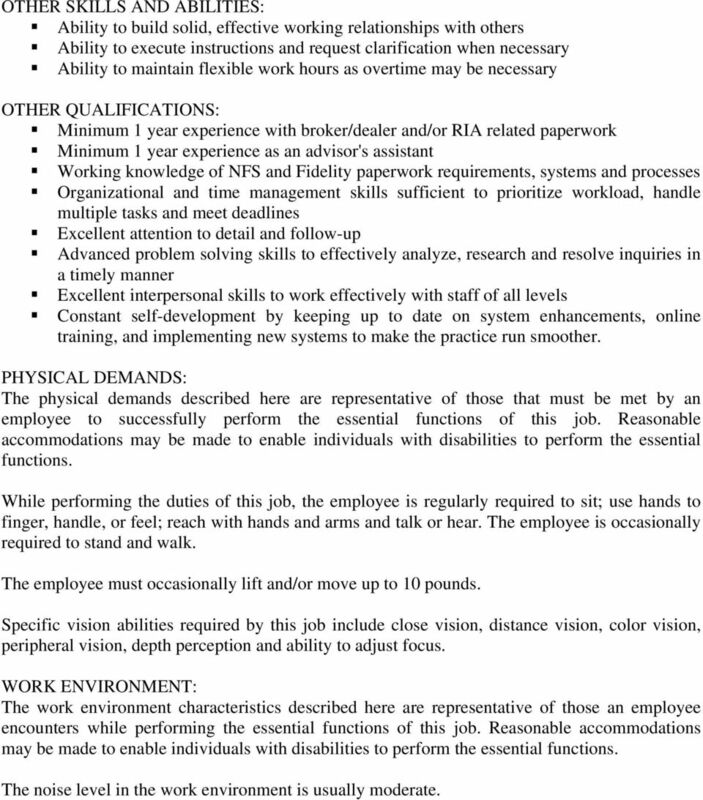 Specific vision abilities required by this job include close vision, distance vision, color vision, peripheral vision, depth perception and ability to adjust focus. WORK ENVIRONMENT: The work environment characteristics described here are representative of those an employee encounters while performing the essential functions of this job. Reasonable accommodations may be made to enable individuals with disabilities to perform the essential functions. The noise level in the work environment is usually moderate. 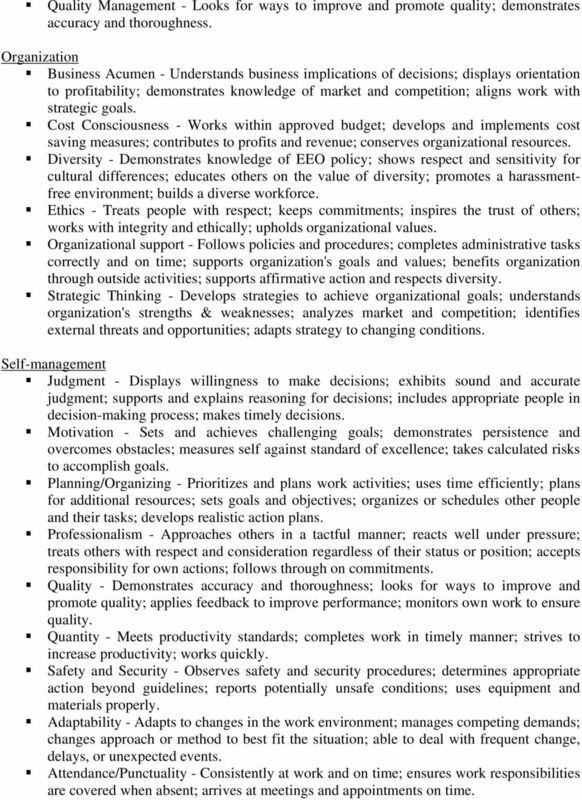 STATE OF MONTANA SECRETARY OF STATE S OFFICE JOB PROFILE AND EVALUATION. SECTION I - Identification. 1236 6 th Ave.